Good content strategy is designed to achieve goals. Too often, content is an afterthought, a last-minute addition. This approach is a mistake—both for your product’s bottom line and user experience. I read Content Strategy for the Web to understand exactly what content strategy is and why (and how) to make it good. Here, I’ll share the biggest takeaways. Content Strategy for the Web is an essential. It’s a breeze to read while still being super informative. The information is broken up into digestible chunks and the tone is fun yet authoritative; above all, it’s reassuring. 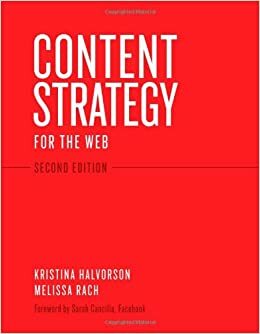 Authors Kristina Halvorson and Melissa Rach know that most of their readers are new to content strategy, and they’re here to help them figure it out. Content strategy—a strategic approach to content—is more involved than simply hiring a copyeditor to delete extraneous commas. It’s taking stock of everything, everywhere—from the text on a website’s “about me” page to what appears on an app’s Twitter feed, and everything in between—and determining if it’s accurate, helpful, up-to-date, and goal-oriented. Step one is developing a core strategy. This takes a concept that Brain Traffic’s Lee Thomas calls the “Achieve-Be-Do”: figuring out what the content strategy needs to achieve, figuring out what content to make and how it will be valuable to users, and what the organization needs to do to make this happen. The authors suggest composing a core strategy statement—one punchy, memorable sentence—to quickly summarize and keep everyone on the same page. Your content depends on the goals you wish to achieve, the audience you wish to reach, and the message you want these users to glean. Content designed to persuade a certain type user may look different than that designed to inform someone else. Halvorson and Rach say that all content should serve a purpose—if you can’t pinpoint what that purpose is, do you really need the content in question? Less is more in the world of content strategy. Defining your user is a key tenant of content strategy. This is the time to get specific. Don’t just say you want to reach “customers,” say Halvorson and Rach—decide if you’re aiming for returning customers or new ones. You need to decide if you’re targeting millennials or doctors based in Florida in order to best tailor your content. Content often gets overlooked or put to the last minute within organizations big and small. There’s been a call for a “content first” approach, or starting projects with words first, design next. But Halvorson and Rach preach a slightly elevated cause: “content always.” This means not only considering the content of a project before designing it, but considering it “throughout and beyond” the project. It’s an all-inclusive, exhaustive process that ultimately sets the content up for success. Great content isn’t just a good thing to have. It’s an essential. But where to start? Performing an exhaustive audit of your website/project is a must—and will provide plenty of evidence of what’s working and what isn’t. Use these numbers to inform your content decisions. Have faith in analytics. Bringing up the puny site traffic numbers of a flailing page can go far in proving the need for better content. Also taking a look at what competitors are doing—and how they’re succeeding—can often be a catalyst for a thorough content strategy. Halvorson and Rach spend a lot of time in the book discussing how to convince people that content is of the utmost importance. It’s an uphill battle—tossing content into the mix at the last minute is still a common practice. The authors suggest using the hard numbers from your audit to convince those in charge that content is important. But the hard work isn’t over when the importance of content strategy is realized. There are typically many different stakeholders (think folks from marketing, legal, etc.) and roles (from content creators to editors to those who approve content) that all must work together perfectly. The best way to ensure a symbiotic working relationship is to make sure that everyone understands their role and how it fits into the bigger process. Having great content isn’t just going from point A (creating it) to point B (publishing it and reaping the rewards.) Halvorson and Rach maintain that the process is about not only creating (or sourcing) content, but maintaining existing content, evaluating the content’s effectiveness, and deciding on best practices, strategies, and policies. Each of these tasks has sub-processes, too. And, say the authors, this isn’t a straight line—it’s more of a circle, a process that repeats continuously. Once these processes are determined, throw everything into a document and share it with everyone involved in making, editing, or producing content. Then give them time to adjust to the new. With patience comes a project whose “content always” approach will lead to success, however it’s individually defined. Content Strategy for the Web is an ideal introduction to the overwhelming world of content strategy. The book’s biggest takeaway? When content strategy—and its best practices—is the cornerstone of your project, everybody wins.